Diet: 99% fish generally 20 – 36 cm (8 – 14 in.) in length. Very rarely, birds, snakes, voles, squirrels, muskrats, salamanders, conchs and even small alligators. Natural predators: Owls and eagles, in North America the Great Horned Owl and Bald Eagles and in Africa, sometimes Nile crocodiles. Tree-climbers such as racoons and snakes are suspected predators of eggs and nestlings. Life span in the wild: Up to 25 years. Clutch size: 3 – 4 for migratory populations and 2 – 3 in non-migratory ones. Natural habitat: Near shallow water, primarily lakes, rivers and coastal waters (freshwater or salt water). Geographical range: It is found on all continents except Antarctica. They are not known to breed in South America or Indo-Malaysia but they are often found there in the winter. 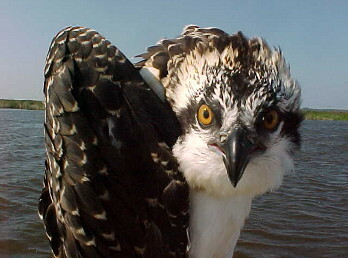 Many osprey populations are migratory and travel huge distances – North American ospreys migrate to the Amazon and even as far as northern Argentina and those from northern Europe to tropical areas of Africa (often the western coast) and even South Africa. These migrations are made at the end of the summer and the return journey at the beginning of the spring (both seasons refer to northern hemisphere ones). Ospreys are one of the most widely distributed birds since they can live practically in any habitat near a shallow body of water with plenty of fish and somewhere safe to build a nest nearby. They are the only bird of prey with a reversible toe on each foot so that they can have two forward and two backwards – an adaptation that helps them carry slippery fish (raptors normally have three forward and one backwards). When flying away with a fish, they will turn it in their feet so that it is more aerodynamic. 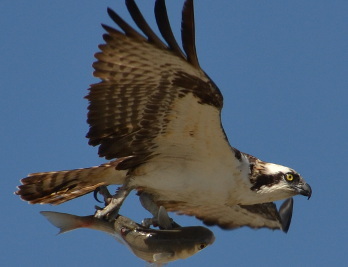 Ospreys have nasal passages specifically adapted for when the bird dives into the water to catch a fish which prevent water getting into their nostrils. They normally nest at the top of trees but sometimes in manmade structures such as billboards, power poles and communication towers. They are almost always monogamous, although very rarely a male may have more than one mate if there is another nest site close enough so that he can defend both. Chicks reach 70 – 80% of their adult size in just one month!